The United States Mint has removed the household ordering limits previously in place for two sets issued to mark the 50th anniversary of the Kennedy Half Dollar. Each of the sets was previously limited to only five units per household. The 50th Anniversary Kennedy Half Dollar Uncirculated Coin Set includes half dollars struck at the Philadelphia and Denver Mint facilities in the standard composition of 91.67% copper and 8.33% nickel with an uncirculated finish. Each of the coins carries the original 1964 Kennedy Half Dollar portrait design, making them distinct from the other previously issued 2014-dated half dollars. Released on July 24, 2014, the sets are priced at $9.95 each. The most recent sales report indicates that orders have been received for 146,222 units from a product limit of 200,000. The 50th Anniversary Kennedy Half Dollar Silver Coin Collection includes four 90% silver half dollars struck at different mint facilities with different finishes. 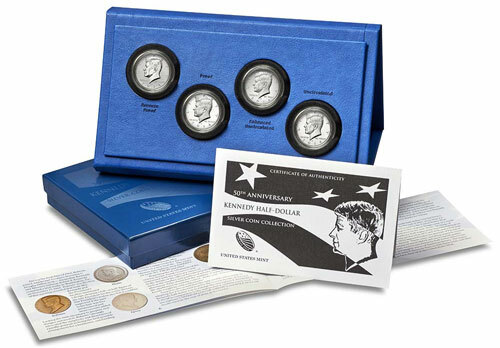 Each set contains a reverse proof coin from the West Point Mint, a proof coin from the Philadelphia Mint, an enhanced uncirculated coin from the San Francisco Mint, and an uncirculated coin from the Denver Mint. All of the coins also carry the original 1964 Kennedy portrait design. Released on October 28, the sets are priced at $99.95 each. The most recent sales report indicates that orders have been received for 137,802 units from a product limit of 300,000. Can somebody verify but it appears that the household order limit is still on for the 4 coin silver set. I hope the 1964 portrait will be continued on 2015 and future years’ Kennedy halves. Well I received my 2 sets, quickly. But 2 coins were badly nicked so I sent one set back in and reordered another set. I recieved that set on Friday. Wow, the most sought after coin, the reverse had a nick right in the middle of his neck. So I have paid for the shipping 5 times. Does anyone have any idea why the Quality control is so bad on this set.